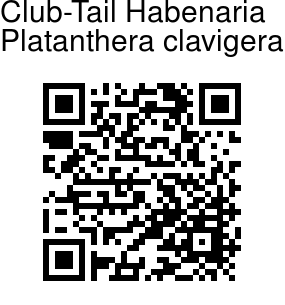 Club-Tail Habenaria is a miniature to small sized, cold growing terrestrial orchid, 30-40 cm tall. 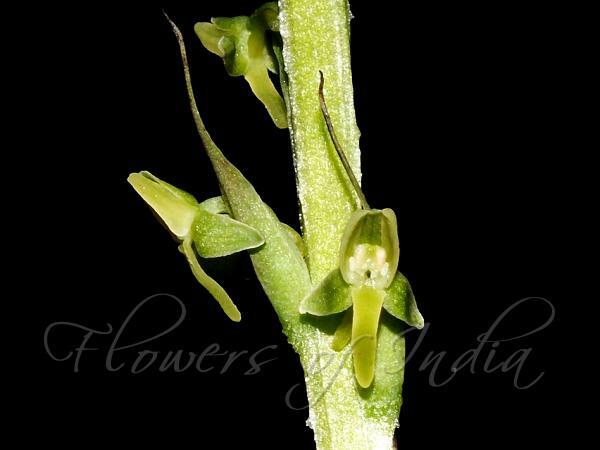 Flowers are 7-8 mm across, uniformly green; flower-stalk and ovary 5-8 cm long. Dorsal sepal is broadly elliptic-oblong, blunt, erect, concave, 3-veined, 2.5-3 x 1.8-2mm; lateral sepals oblong-lanceshaped, reflexed 3-veined, 3-3.5 x 1.5-1.8mm. Petals are elliptic-oblong, blunt, base oblique, 1-veined, 2.2-3 x 1.5-1.8 mm. Spur is club-shaped, hanging, rounded, laterally compressed, 5-6 x 0.8-1.2 mm. Column is broad, 0.5-0.6 mm; stigmas 2, nearly round; anther locules 0.5-0.7mm across. Flower cluster is densely many-flowered; axis 6.5-22 cm long; floral bracts lanceshaped, tapering, margins minutely glandular-fringed with hairs, 0.9-1.4 x 0.15-0.22 cm. Stem is erect, bracteate above; basal sheaths tubular, blunt, 2-4 cm long, mouth wide; stem bracts narrowly lanceshaped, 1.8-2 x 0.2-0.3 cm. Leaves are 3 or 4, inserted along stem, lanceshaped to narrowly elliptic, pointed, stalkless, sheathing at base, 6-11.5 x 1.3-3.5 cm; sheaths 2.5-3.5cm long. Fruit is stalkless, ovoid, ridged, 8-9 x 3-4 mm. Club-Tail Habenaria is found in the Himalayas, from Kashmir to Bhutan, at altitudes of 2000-4600 m.
Identification credit: Pankaj Kumar Photographed in Chakrata, Uttrakhand.